A controversy-laden season that ends Sunday with Super Bowl XLIX has been a year of “humility and learning’’ for embattled NFL Commissioner Roger Goodell. Domestic violence and child abuse cases from Baltimore Ravens running back Ray Rice and Minnesota Vikings running back Adrian Peterson rocked the league. Weaved in were allegations of a cover up by the league and unfair punishments, which were later enhanced. More recently, the deflategate controversy and battle with the NFLPA over the league’s new personal conduct policy came to light. It all put Goodell under fire. Goodell focused on the progress the NFL has made in the last year, claiming a 68 percent decrease in hits to defenseless players and a drop in concussions from 173 in 2012 to 111 in 2014. The NFL will also continue its work on concussion prevention and protocols while exploring alternatives to the extra point attempt. The goal posts were narrowed from 18.6 feet to 14 feet apart for the Pro Bowl last Sunday and were moved back to the 15-yard line making it a 33-yard kick. Other possible reforms include instant replay on penalties and expanding the playoff format to include more teams. Both came with caveats from Goodell, who doesn’t want to further disrupt the pace of play or interrupt the end of the college football season. While Goodell is trying to move the league forward, he still took accountability for the NFL’s missteps in 2014 and vowed to improve in the future. 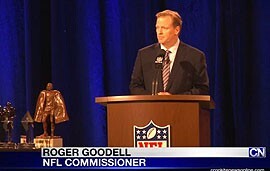 Roger Goodell took the podium Friday for his annual State of the League address to reporters. He took the time to apologize but also attempt to move the NFL forward.